Previously, students will have been introduced to recursively defined functions. I’ve thought a lot about the value of introducing recursive functions at the beginning of algebra II, which can be a discussion all by itself. However, the “Fry Bank Account” problem provides an excellent opportunity for recursive growth functions and the costs of recursively defining functions. 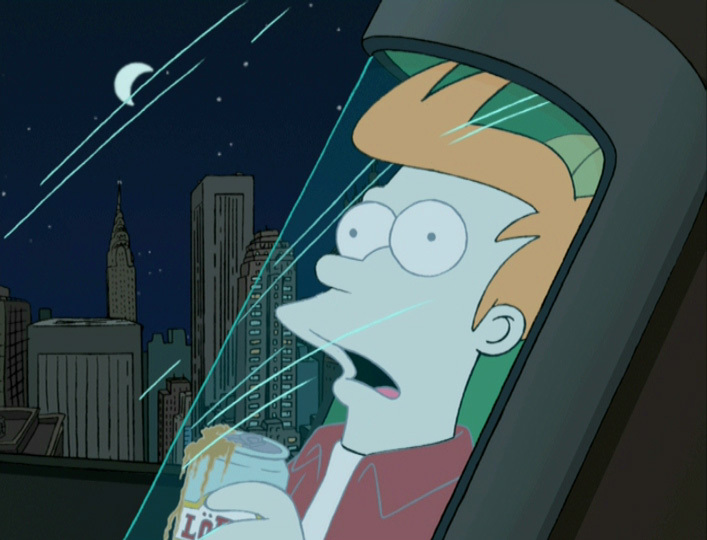 The question is simple: It’s the year 3000 and Fry needs some cash. Luckily, he left $0.93 in a savings account back in the year 2000. If there’s 2.25% interest, how much is Fry’s account worth? This should lead to an interesting and meaningful version of Dan Meyer‘s envisioned plan of the clip found by Timon Piccini. The opener will give a quick example problem in which students have to recursively define a formula for a geometric sequence. 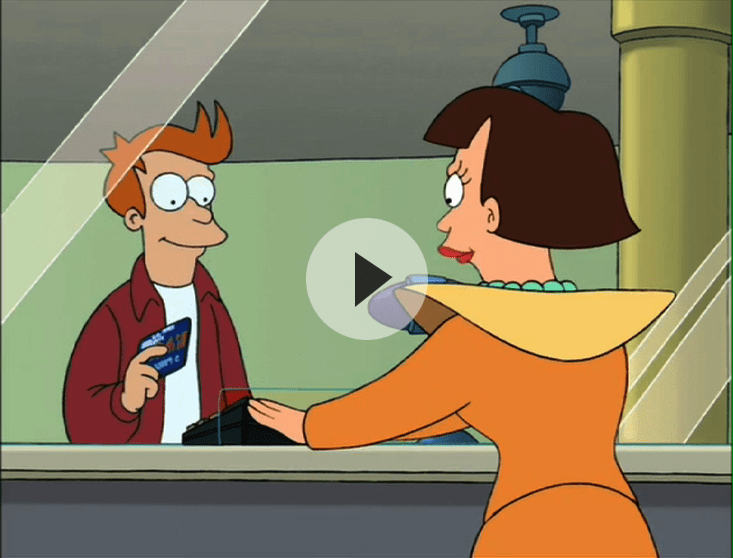 In preparation for Futurama clip, I’ll also ask how much a $59.99 pair of jeans costs if there is 6% sales tax. Here’s a good as any place to note that the the Futurama problem assumes interest compounded annually. This is really not a major concern lesson, but I will be interested to see what kind of questions are asked about how and when the interest rate is applied. I suspect few will see this at first and use the sales tax question as a model to find Fry’s account balance for year 1, year 2, year 3 and so on. 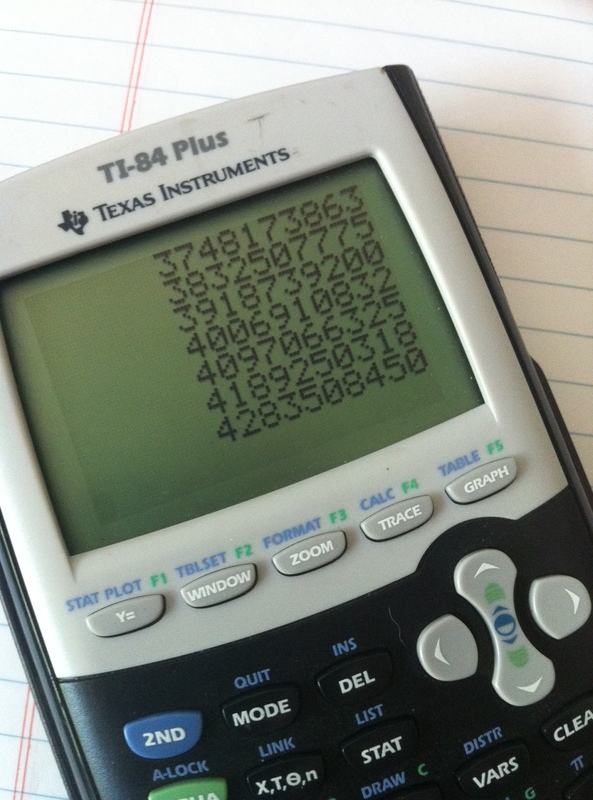 A student feverishly pushing the “Enter” key of their calculator 1000 times. That’s the type of action and situation that really drives mathematics: “There has to be a better way.” Of course, there is. Perhaps some student will write out their work algebraically. Perhaps, then, they’ll see this common factor popping up. However, this would be quite a leap from a concrete situation to an abstract one and I’m not expecting any student to make it. Instead, I want to set the scene for that future abstraction. “Remember when Mark pushed the enter button 1000 times? Wasn’t that awful?” Then we can get to the explicit formula and – whoa – all we need is one push of the button. But for now, I want the focus to be on recursion; what it can do, how we can use it to define methods of problem solving, and why it is not always the best option. While the goal is modeling growth and decay using recursion, exponential functions is the powerful, underlying concept. Thus, it’s a natural step for a student who breezes through the recursive aspect of the exercise to try to connect an exponential-looking graph to an exponential function. Of course, it doesn’t stop there. We could discuss annual versus monthly compounding interest. Or, as Dan Meyer suggests, to stay on the objective at hand I could ask when Fry hits the $1,000,000,000,000 mark. It’s clips like this that I’m constantly looking to bring into my classroom: lots of roads to take from just a short video of pop culture. As the school year winds down and I give this blogging thing a go, I figured a nice way for me to reflect on the year and hopefully share some things would be to recap some highs and lows. A refresher of modeling one-dimensional motion using one of Dan Meyer’s “Falling Rocks” 3-Act lessons was our start, followed by a discussion of Angry Birds, initial vectors, and some trigonometry and so on. 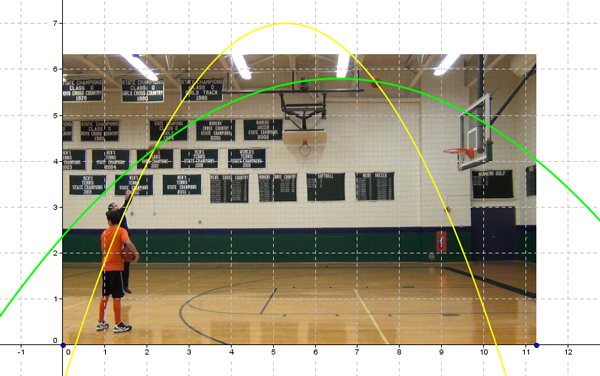 Suddenly, we had a reason for wanting to know a vector’s angle from the x-axis: will the bird hit the piece of wood I think it will? I’ve found the beauty of the Smart Board is that kids, for one reason or another, love playing with it. But they love drawing on my old-fashion white board too. So, how can I really take this expensive piece of equipment and make it more than a combo projector-white board? I think Angry Birds is a good start. 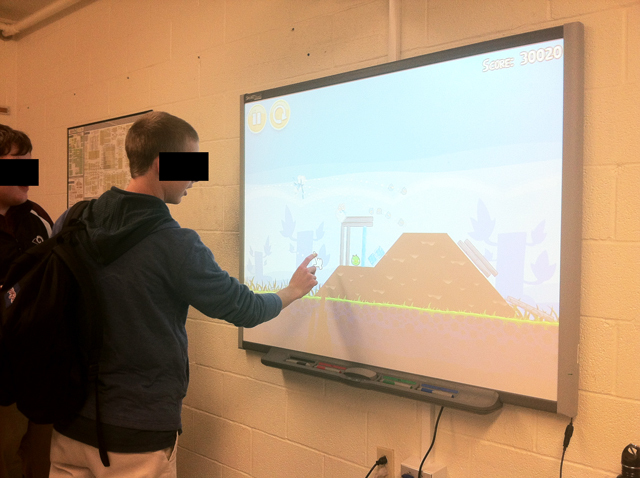 Angry Birds in class, for a whole class period, not just the 5 minutes in between class and the 5 minutes at the start. Let’s make teams. Who’s the best player at Angry Birds? Why is she the best player? Why can’t you beat her? How can you beat her? Do I save Angry Birds for when we discuss parametric equations or get right to it when we start vectors? How can I turn a 5 day mini-unit into a 3 day mini-unit? Or, how do I make this 5 day mini-unit more mathematically rigorous? I’m a little worried the time taken away from the math to play the game, build a real-life level was too much taken away from practice in class (based on concept tests and the final exam after). 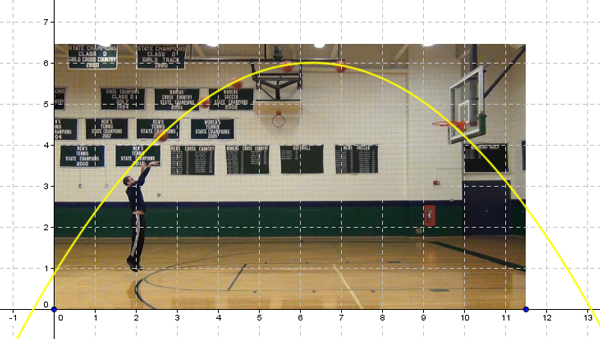 If I’m not going to get to Polar Equations anyway (like this year), can I play with a more thorough connection of trigonometry to parabolic motion prior to getting to Angry Birds? 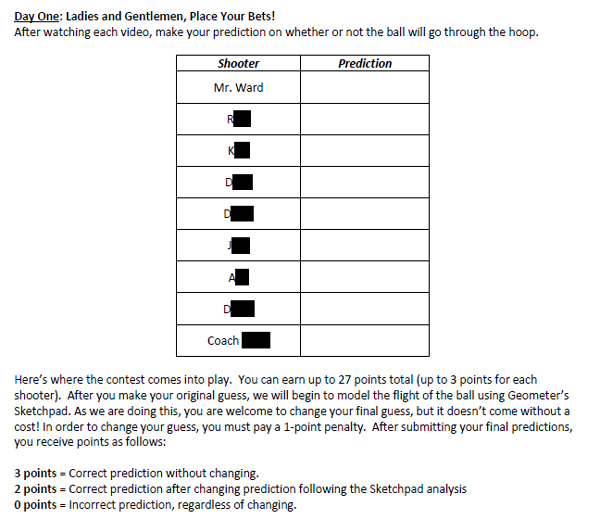 Next on tap: The failure of my texting in class activity, and why I need to try it again.